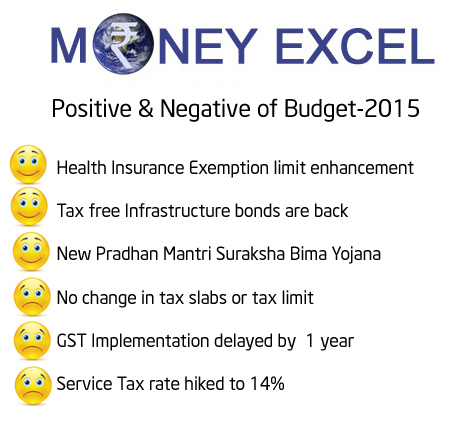 Union budget 2015-16 is announced by finance minister Arun Jaitley today.Expectation from budget was very high, but budget seems to be highly disappointing. No major tax reform and relief. GST is delayed by one more year. 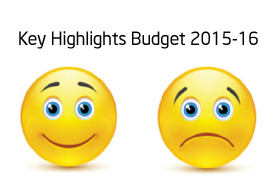 Let’s look at Key Highlights of Union Budget 2015-16. Exemption limit for transport allowance is enhanced to 1600 Rs/- from 800 Rs/- per month. Health Insurance premium exemption limit enhanced from 150000 Rs/- to 25000 Rs/-. For senior citizen this limit is enhanced to 30,000 Rs/-. Senior citizens above the age of 80 years, not covered by health insurance, to be allowed deduction of 30000 Rs/- towards medical expenditures. Sukanya Samriddhi account is under EEE category. Payment to beneficiaries including interest payment is exempted from tax. Wealth tax is abolished. 2% surcharge on super rich. Deduction limit of 60,000 Rs/- on certain specified disease is now enhanced to 80,000 Rs/- for senior citizen. Additional deduction of 50,000 Rs/- for contribution to NPS under 80CCD. Imprisonment in case you do not file income tax return or you have filed income tax return with incomplete details. Tax free Infrastructure bonds are back, these money will be used for road, rails and irrigation projects. GST to be implemented from next financial year. GAAR is differed by 2 years. Imprisonment for 10 years for non disclosure of black money. PAN number is mandatory for any transaction above 1 Lac. Central Excise duty increased to 12.5%. New National Insurance scheme Pradhan Mantri Suraksha Bima Yojana is introduced, offering coverage of 2 Lac rupees for just premium of Rs.12 per year. What is your take on this budget. Do share your views! Pathetic experience as I did 2sip through it , payment got deducted but got a message that process not completed its now 20 days nobody called me up and no one sharing a complete process.